It’s always been tough to find the files that is not being backed up on your hard disk. That files which you though will copy/back up next time you connect your hard disk and forgot the files. It may be a bit easier when you have very small no files, but with hundreds and thousands of files with multiple directories, it becomes very difficult to find that missing files. To this problem, we have a solution called PathSync. I found this opensource software a month ago when I was really in a bad situation, when there were actually 2 backed up folder from my laptop and didn’t knew which one is the latest. With 20k+ files and 350+ folders I was in real trouble. I googled a bit and came around this software and it came out to be an excellent solution to my problem. 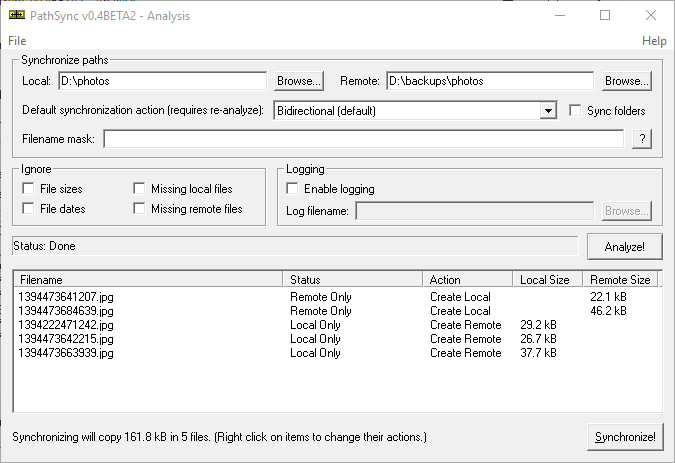 PathSync is an interactive directory (path) synchronizer for windows. You simply provide 2 directories to it, and it will list the difference between 2 directories, with missing and extra files from both the directories. It allows the user to select which files to overwrite, which to delete, which to ignore and synchronizes those 2 directories. You can download PathSync from here.